The Erweka Tablet Hardness Tester TBH 320 measures up to 4 parameters in a user friendly, responsive instrument. This hardness tester will record weight, thickness, diameter and hardness, and will store general data for up to 20 products in memory. The TBH 320 allows users to measure either under constant speed or constant force principles, and will display on the digital screen 2 individual plus/minus tolerances. Users can also store remarks that can be called up for additional tests, with the option of printing out a hard copy of data through a parallel printer port. Parameters for this hardness and combination tester are quickly set through the alpha numeric keypad, and shown on the easy to read LCD display. 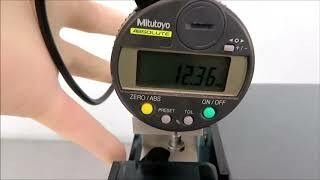 This combination tester is also partnered with a Mitutoyo digital Indicator to measure force. This Erweka Tablet Hardness Tester TBH 320 has been fully inspected and is performing to expectations. All of our lab equipment comes backed with our standard warranty. Should you have any questions, please don't hesitate to contact us.